History: Around 1980, 1st Man introduced to the press that he had joined forces with a partner. This partner was dubbed “Ocean Boy” by the media due to his aquatic powers. Soon, that name was changed to Oceanus on bequest of this new partner. According to media accounts, Oceanus is the last survivor of a race of human-like beings that once lived under the Earth’s oceans. Oceanus served as partner to 1st Man and a member of the loosely organized super-group known as the F.E.D.s until he disappeared with 1st Man on a mission in 1992. Powers: Oceanus can survive underwater or on land with no apparent deficit in either environment. He is an excellent swimmer, and he has exceptional strength, the upper level of which is unknown. It is theorized that his powers are the result of having lived beneath the tremendous pressure of the Earth’s ocean for most of his life. I was going to post another character biography today, but I figured out a way to loop my previous post from the ending back to the beginning and thought I would write about it instead. You see, I last mentioned the very well produced webseries Out With Dad. Out With Dad, which is produced in Toronto, Canada, addresses the important topic of homosexuality and how homosexuals are treated in our society. This is a very important social issue as western society evolves its collective attitude and laws to grant equal and fair treatment to all people regardless of such differences as sexual orientation. This struggle for equality is perhaps the most important civil right issue we currently face. I began my last entry by writing about comic creator John Byrne. I can loop the discussion from Out With Dad back to Byrne because Byrne, a former Canadian, created the character of Northstar. Northstar, a member of the Canadian superhero team Alpha Flight, was the first mainstream comics character that was gay. Back in the 1980’s, when the Alpha Flight comic first premiered, Byrne wasn’t allowed to say outright that Northstar was gay. However, he managed to insert subtle hints into the Alpha Flight stories to indicate the character’s sexual orientation. In a recent issue of John Byrne’s Next Men there were two characters that were a lesbian couple. The depiction of this couple impressed me because of how it was done. There was no overt mention of the sexual orientation of the characters, but there was no doubt from how they interacted that they were a couple. So here you have an example of an evolution from not being able to say a character is gay, to it being there with no need to point it out. I think that’s really cool! I have nothing against the big comic characters, such as Spider-Man and Superman. I’ve enjoyed many a story in such comics. However, there is something special about what I would call a ‘labor of love’. That is, a creation that is close and personal to the creator. 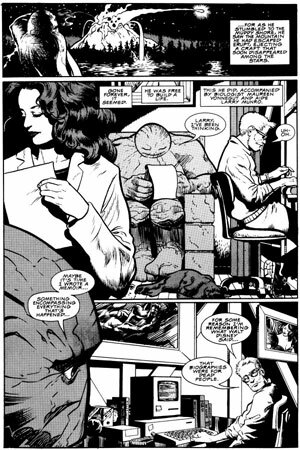 For example, John Byrne has long been my favorite comic artist/writer. He became a fan favorite on titles such as X-Men, Fantastic Four, and Superman. But his recently completed Next Men (Currently published by IDW http://www.idwpublishing.com/) is a treat of a different sort. It is a creator-owned title. That is, all the characters are Mr. Byrne’s to do with as he thinks is best. I think this is why Next Men is my favorite Byrne work. It isn’t just that you wonder in anticipation as to what happens next, but also that it reads like you’re seeing a piece of work that shows best John’s creativity, unburdened by editorial fiat. My all-time favorite creator-owned title is Paul Chadwick’s Concrete (Currently a part of Dark Horse Presents http://www.darkhorse.com/). Paul does an excellent job weaving a character-driven tale that also confronts some of the challenges of our society. Concrete reads as a true labor of love. Not all creator-owned comics are made for large publishers. Small-Press and Independent comics are most often created by people who have a story they want to tell, rather than something they know they will find commercially successful. The list of exhibitors at the Small Press and Alternative Comics Exposition (SPACE http://backporchcomics.com/exhibitor_info.htm) is an example of creators who are making something primarily out of the love of their creations. There you see personal projects that reflect the passions of those creating them. No matter what the comics are-adventurous, comical, personal, or whatever- they are labors of love from their creators. Labors of love are not limited to comics and printed media. Out with Dad (http://www.outwithdad.com/) is a webseries that recently got me thinking about this topic. If you don’t know the term, a webseries is like a television series that is released on the Internet, via one or more websites. Out with Dad isn’t made for profit but rather made because the show’s creator, Jason Leaver, wants to tell the story. Out with Dad is an excellently written series about a single father raising a teenage daughter who is a lesbian. It deals with the topic of teenage homosexuality in a sometimes funny, sometimes heart-wrenching, and often thought-provoking manner. The series is produced, written and directed by Jason. Everyone else involved, including cast, crew, and owners of locations, are volunteering their time and space. When you don’t consider these factors, the series is an excellent production. After taking into account the lack of financial incentive in creating the series, it shines as a great example of a labor of love. 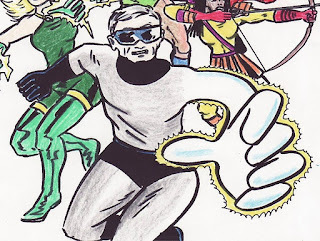 Between posting about conventions and other artistic accomplishments, I thought I'd do some biographies of characters from the F.E.D.s, starting withe the first heros of them all....1st Man! History: In 1974, 1st Man stopped a group of terrorists at a college campus. After the event, he gave an interview with the press. Based on this interview and further appearances, the media reported that 1st Man was originally a Biologist who received his extra-normal power through an experiment gone awry. He kept his identity secret from the public but made many heroic appearances by himself, with his partner, Oceanus, and with the super group known as the F.E.D.s before he and Oceanus disappeared while on a mission in 1992. 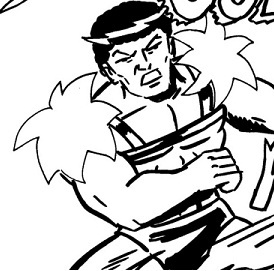 Powers: 1st Man can morph his body, stretching his appendages to lengths seen to exceed 10 feet from his body. When he does this, he is granted above normal strength. He is also immune to the effects of lasers when he is in his morphed state, as they bounce off him. He has been seen to morph his entire body, but incidences of this are rare.